The time is here---I will finally be taking some of my creative process outdoors en plein air. 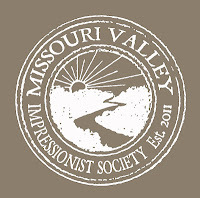 Coming April 21, I will begin this journey accompanied by members of my organization, Missouri Valley Impressionist Society. We will be heading up to St. Joseph, MO in the historical Krug Park. This area will be a focus in many of my works to come as my wife and I are leaving Kansas City, returning to our hometown St. Joseph. With this said, I will plan quite a few paint outs in St. Joe and the several parts of Missouri's Northwest. This month the MVIS will begin in becoming part of St. Joe's art community. Krug Park is one of many Crown Jewels of St. Joseph, MO. Opened in 1902, it is the city's oldest and largest park with Italian Renaissance structures, extensive landscaping and flowerbeds. The park's 163 acres house a natural amphitheater, a lagoon, rose gardens, picnic areas, an Italian castle, scenic walking trails, and various playgrounds.